This is a nicely designed mission. Nowadays it is quite easy again because the Trojan horse conveniently parks itself in the critical moments – but let’s do it step by step. 1. At the start: Upgrade as usual and build a catapult. There is one summon portal. Your first goal is to destroy it; so don’t wait at start and upgrade, but do it “on the move”. 2. Contrary to earlier versions of Atlantica the horse will now move by itself to the spot where you want it (orange “P” in the map). So move directly near the summon portal. Avoid the monsters around E4. 3. Destroy the summon portal at H4 and all monsters in that area. 4. 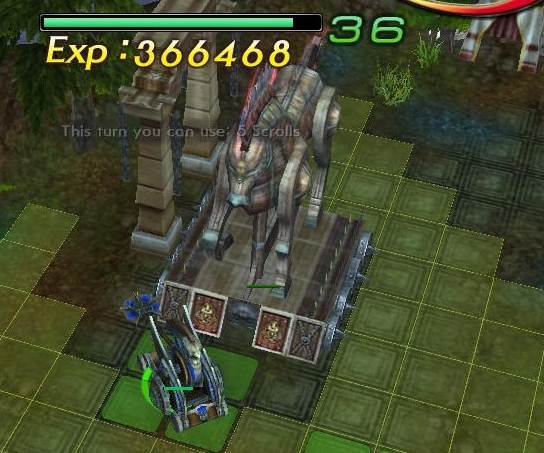 Block the horse with your catapult (it will try to move again) and kill all monsters in the area D-F/4-5. Don’t trigger Laocoon yet. 5. Trigger the mini-boss Laocoon when all monsters nearby are dead (white high-lighted spot). Your horse is still blocked by your catapult, I hope. 6. Take out the mystic stone at F8 with your cannon main. You have a cannon main, haven’t you? If not your catapult must move, thus unblocking the horse. That is no real problem because you can park the horse below the pavillon at E6/7 ( the black square in the map). There are some monsters near the mystic stone; kill them, too. 7. After destroying the mystic stone move your way up to B11. You will encounter a nameless mini-boss around D8 but if you can’t handle him comfortably you should not do this mission anyway. The horse should still be blocked, either at the pavillon or (see the video with Fritz) at about E8. In B11 there is a flametrap. Your horse will later on move up exactly to this spot and bask in its flames. If it is damaged already I advise you to disarm the trap. Otherwise don’t bother because now at least the flame trap will vanish after two or three turns and your horse can cope with the damage it causes. 8. Destroy as many monsters as possible before the gate in D11. Clear the ante-room of Deiphobus (EF/11,12), the one with the four pillars. When this room is cleared (or nearly cleared), move your catapult forward. There is no need to block the horse anymore because it will stop at B11 anyway. And you could put your catapult to good use because you can kill the mystic stone at H13 over the wall (if you don’t have a cannon main). 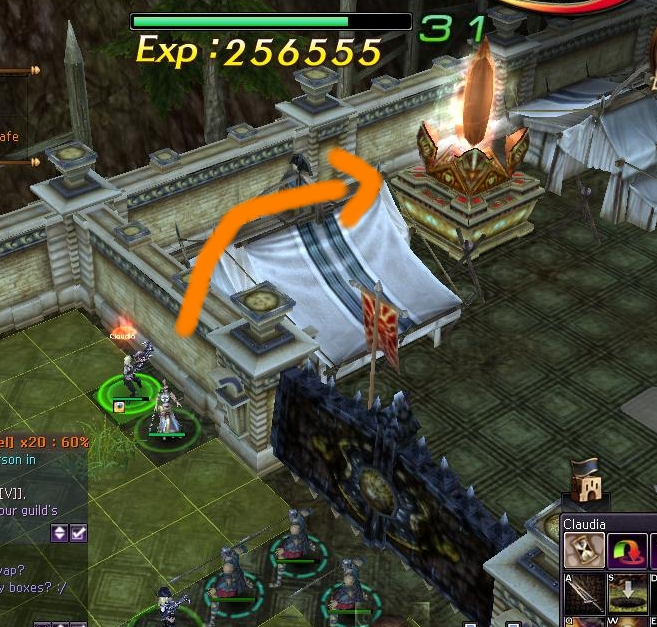 Position your cannon main as shown and kill the mystic stone. a) I hadn’t moved my catapult forward after the situation in the ante-room was clear and so the mystic stone still stood. Bad. b) I hadn’t lured Deiphobus away from the mystic stones. Because the damage Fritz and his merry band does is quite puny they couldn’t kill him. At least not in the first attempt; later in the video it is shown how it can be done. 10. After killing all the mobs there destroy your catapult and build a boat. Your party triggers “Secure the way to the dock” and should move to K11. DON’T trigger the next objective (white spot near dock) yet! 11. Move your boat so that you avoid triggering the objective and seth it. If you have a cannon main move it in the direction of K11 at the beach and try to spot an enemy boat – if you are lucky you can destroy it from the shore. Destroy the rest of the hostile boats with your ship. Avoid the peninsula with the cannon mob group. 12. When the enemy fleet is destroyed, go back, enter the boat with your party and trigger the next objective. Now another boat appears, allegedly with Helen on board. To my surprise the mission is quite doable even with a level 119 musician main, as shown in one of the videos below. The first video in two parts shows how Claudia storms through the mission. The second video shows the first run with Fritz of this mission, containing some grave mistakes. 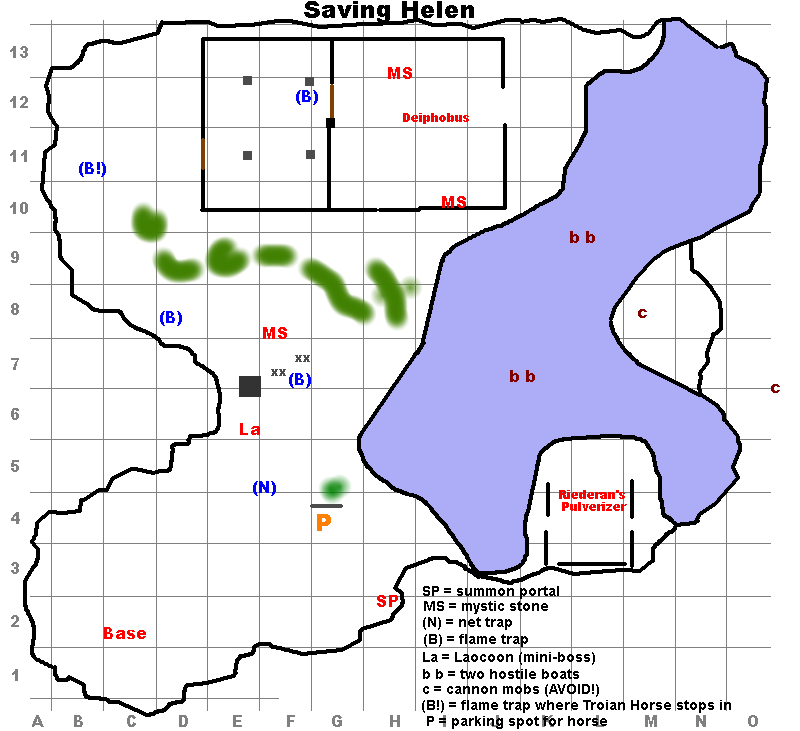 The third video depicts the second Saving Helen run of Fritz. That is much smoother to look at, but of course you miss out my clumsy mistakes of the first run (and some bad jokes about mathematicians). The fourth video is from Claudia (done on 2012-07-11) and is also very smooth. Something worth noting: If you’re slow killing the Pulverizer, there’s a chance(and I was just an unfortunate victim of this) that Helen’s Galley will derp it’s way around to where those cannon mobs are and be sunk while you’re not paying attention. One more thing: Deiphobus is passively healing boss like Alexandra in Hidden Power tbs. When you run Hidden Power you can destroy gate first and it prevents mobs and Alexandra from healing or you can take her far from gate. But I don’t know how to stop Deiphobus healing. That’s why it is really hard to kill him if your main is not Instrument- or Cannon-main. There are two mystic stones in Deiphobus’ room. You have to take down both to prevent D from self-healing because D prefers to waddle around in the middle, thus being in the healing zone of at least one of the mystic stones. You can destroy the left mystic stone (H13) from behind the wall of the ante-room (F12/13) but I haven’t found a way to destroy the right mystic stone (I10). I haven’t noticed yet that he heals himself when both MS are down. After the christmas event is over I will reactivate Fritz and see how he fares against Mr. D.
Pretty good mission indeed,i haven’t tried it cause i hate guard useless npc, but i decided to try and everything went smooth, the horse can be parked, so its not need to be guarding it in every moment, the mobs are easy to kill (well im a lvl 133 gun main with evil +2), even i can kill the mobs with my sheriff unsethed (lvl 130, +2 evil gun), and about the surprise attacks like the helen boat comitting suicide there is a way to prevent this, after you kill Mr.D dont go to the port, instead make a boat pack ur mercs and go to kill the cannon mobs, and then return and clear the port objetive, in this way the anoyng cannon mercs cant kill the helen boat, another tip, you can park the horse directly in the tent where laccon spawns (E-7)its more easy park the horse there and u can use the catapult to destroy the stone in 8-F, and finaly there is a flame trap near the port (12-K). try to get a janni,instead of the inventor, its more usefull, and its stance give him a lot of attack. Update 2012-04-15: It is possible as shown in the video of the updated article. when U are done with killing the left MS, U can destroy the catapult and build a ship. ship can kill 2nd MS at J-9 spot. The gate is pretty small, so U can use your main and witch to block the path of the boss, and let the Catapult + the fire from meteo do the damage. In this position, Mr. D cannot heal himself. Side note: his spell casting rage is 5 squares, his AoE is 3×3, so let your Oracle stand at least 6 square away, or stand on side, not right in front of him. Hi, thanks for video. I have a question: your FB and Stance were maxed?